The Polish chicken is a European chicken breed known for its crest of feathers. In addition to combs, their heads are adorned with large crests due to a cone (called a protuberance) on the top of their skull. The crests cover almost their entire heads. 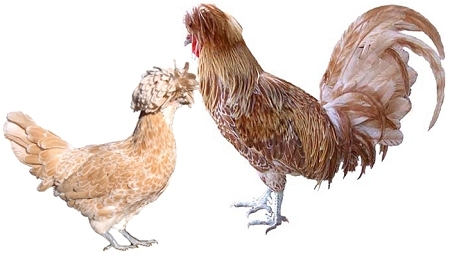 They are normally tame chickens, but can act out because the crests on their heads limits their vision. This limited vision can impact their temperament. Polish chickens are bred primarily as a show bird, but were originally egg layers. Accordingly, Polish do not get broody and are noted for their white eggs. They may be bearded or non-bearded. Hens weigh around 4.5 pounds, and roosters 6 pounds.